pComb3Z is the newest of the pComb vectors. Improvements over pComb3 include increased stability and introduction of SfiI cassette for cloning of full Fab, scFv, peptide and other protein for phage display. 6xHis and Myc tags allow for purification and detection. 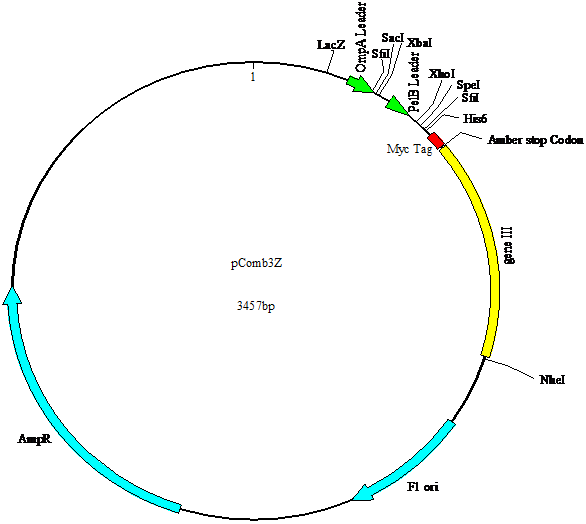 An amber stop codon was introduced to turn-off expression of the pIII fusion protein by switching to a non-supressor strain of E. coli allowing production of soluble protein without subcloning. Alternatively, the gene for phage protein pIII can be removed by SpeI/NheI digest.